Erik The Red, the mouser of The CSS Acadia, moored permanently in Halifax harbour as a museum ship, retires today. Even as I write this. So, I will repost my own encounter with Erik, one day during the winter. Dark comes early these days, and will do so for months. My frequent walks along Halifax harbour now usually begin in the dusk and always end in the dark. The lights near and far are beautiful, and the lack of fellow travellers is pleasing. And any ships that pass in the night on their way to sea are well-lit sights to see. On ship stays in port, however. It is The CSS Acadia. The CSS Acadia survived the Halifax Explosion and sailed for many a long year afterward. She served in both World Wars and retains her original steam engines and boilers. She even has her original crew quarters. 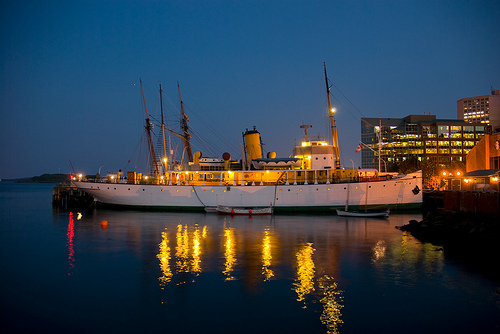 The CSS Acadia is still afloat in Halifax Harbour and is a part of the Maritime Museum of the Atlantic. She is open to visitors and receives many. She also has a cat. I met the cat the other night (not for the first time). He is an orange tabby called Erik, and is classed as the ship’s Junior Rodent Control Officer (Junior because there is a more senior cat aboard). He is not a “house cat”, but ranges the wharves at will. He is generally intent upon his business but deigns to be friendly. If he deems he has the time, he’ll give you a look over and allow some fraternizing. Perhaps the lack of human folk prompted him to trot toward me and encourage some human hand contact. At any rate he allowed himself to be patted a few minutes. He even walked with me (well . . . scooted around me as I walked) for a few ship lengths before he returned to his nocturnal endeavours. A sleek, gold arrow aimed into the dark. Erik joined the Museum Crew during the height of the Tall Ships 2000 craze. One evening, Steve Read, one of the ship’s staff, was proceeding back to the vessel when he noticed he was being followed by an orange tabby, who wouldn’t take no for an answer. He came aboard ship and has been a part of the crew ever since, taking on the role of Junior Rodent Control Officer. A trip to the vet revealed that Erik was about three years old and that a return visit would have to be arranged for another three months. Despite coming back from that second visit with two less pieces of tackle, Erik’s love for the ship and her staff is as strong as ever.